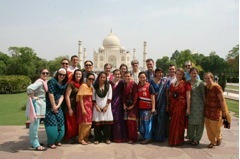 This trip will study the culture of India, a melting pot of religions and castes. Students will see how Hindus, Muslims, Sikhs, Jains and Christians coexist in (relative) harmony, and how the work of Gandhi and Mother Teresa has impacted the centuries-old caste system. Along the way, we’ll see how these cultures are expressed through their art, architecture, and food. Students will tour the Taj Mahal, eat curry from banana leaf plates, watch monkeys scampering around temples, go bodysurfing in the Indian Ocean, ride elephants and take auto-rickshaws to a Bollywood cinema. At the end of our trip we’ll spend a few days in Sri Lanka, where students can visit tea plantations, go white-water rafting and snorkel among coral reefs. Although primarily educational, there will also be a service component to this trip, as students have the opportunity to help patients in Mother Teresa’s missions and ride ox-carts to bring medical care to Untouchables in remote fishing villages. Note: We’ll encounter various conditions, from three-star hotels to extreme poverty during this trip. Students should be prepared for 110-degree weather and high humidity. Day 1-2 – Depart from Portland, with a stop-over in L.A. en route to Delhi. Day 4 – Travel to Agra – After a Bollywood dance workshop, we’ll take a coach to Agra. Once there, we’ll have a free afternoon, then take tuk-tuks to a nearby cinema. Day 5 – Agra – We’ll tour the Taj Mahal in the early morning, then visit Agra Fort, where Shah Mahal was imprisoned after building the Taj. Day 6 – Travel to Ranthambore – We’ll go by bus to a small village, where we’ll get a cooking lesson before riding camels in the village. We’ll then journey on to Ranthambore National Park, where we’ll take a jeep safari looking at some of the local fauna, including (hopefully) some of the few remaining tigers. Day 7 – Ranthambore to Jaipur – After another early-morning tiger safari, we’ll hit the road to Jaipur, the third corner of the Golden Triangle. There we’ll see a Hindu temple to a monkey god, where monkeys roam the grounds and dive into outdoor pools. Day 8 - Jaipur – We’ll worship at a local Christian church, then explore the Amer Palace. After lunch, we’ll go to Elefantastic, where students will ride elephants, and have the opportunity to bathe the elephants before we hop an evening flight to Calcutta. Day 9 – Calcutta – We’ll tour Calcutta, hang out with university students at an intellectual café, tour a Jain temple, and then see the Motherhouse, where Mother Teresa lived. Day 10 – Calcutta – We’ll spend a day volunteering at one of Mother Teresa’s Missionaries of Charity missions. That evening we’ll take in a movie. Day 12 –Chennai – We’ll drive south to visit a crocodile farm, then on to Mahaballipuram, where we’ll visit beach temples and carved stone sculptures. After a thali lunch served on banana leaves, we’ll spend the rest of the day at the beach, where we can bodysurf in the Bay of Bengal, or rent snorkels to look for the legendary Seven Lost Pagodas, which were overrun by the sea. Day 13 – Travel to Nellore – We’ll hike up to St. Thomas Mount, where we’ll see a relic of Doubting Thomas, who reportedly brought Christianity to India. Then we’ll go by train to Nellore, a smaller town (only 1/3 of a million) where we’ll stay at an orphanage. Day 14 – Nellore – We’ll ride ox-carts to remote villages, where we’ll conduct medical camps for Untouchables (and entertain tribal kids) in remote fishing villages. Day 15 – Nellore – We’ll split into groups to participate (and possibly preach) in village churches. Day 16 – Travel to Sri Lanka – A long travel day, as we hop a train from Nellore to Chennai, then fly to Colombo, Sri Lanka. Day 17 – Kandy – We’ll visit an elephant orphanage on our way to white-water rafting on the Kitugala River, then on to a tea plantation. Day 18 – Trincomalee – We’ll drive to the northeast coast, where you can take a surfing lesson or snorkel. Day 19 – Trincomalee – A day to relax at the beach, where we can swim or snorkel. Day 20 – Travel to Colombo – After one last swim we’ll drive back to Colombo to pack for our long flight home. Day 21 – Fly to Portland, with a layover en route.